We R Sports is proud to be able to offer this high quality Weight Bench. It is one of the strongest and sturdiest available on the market today. 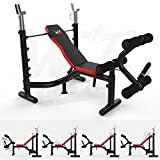 The frame has a good base for solid stability and has a chip resistant finish.With a stylish and durable design, this functional workout bench is sure to stand the test of time and deliver your perfect body! From a leg developer station for leg curls and extensions to test your lower body, to a chest press station with safety catchers to offer safe upper body strength training, this bench will ensure your workout can be varied whilst retaining its effectiveness.